For eons, humans naturally ingested friendly soil born organisms (SBOs) from chemical free organic foods they consumed each day. Little was known about these beneficial, life-supporting microbes before the mid to late 1900s, and in truth, not until the last ten years. Today, Probiotic researchers around the world work endlessly in their labs offering up more and more evidence to support the critical importance of these friendly bacteria that have all but “gone missing” from our daily diets. It has now become obvious to many, in the medical and alternative world, that replacing these missing organisms is paramount to digestive health and our long-term wellbeing. BODY BIOTICS INTERNATIONAL, with a 37 year old Prebiotics & Probiotics formula, has long known the vital role that SBOs play in gut health for both humans and pets. From the moment we secured exclusive worldwide marketing rights to this formula (April/1995), we have remained steadfast in our commitment to provide the safest, most effective natural Probiotic to our customers. With contradictory information and general confusion in today’s Probiotics marketplace, we have reviewed the dynamics of our formulation, culturing process and ingredients; all, to offer our customers a better way of understanding the exceptional qualities of BODY BIOTICS™. After an intense review, we’ve concluded that the best words to identify BODY BIOTICS™ and its wide range of whole body health benefits are: “Bio-Identical” SBO Probiotics Consortia™. What are the benefits of BSBOPC™? Why do I need BSBOPC™ in my daily diet? Scientist report 80% of immunity is housed in the intestines, our primary site for practically every disease. Nutrition assimilation, hormone production, energy regulation, hunger, production of happiness chemicals, and much more, all are controlled and/or composed by this master regulator organ that researchers have recently started calling the ‘second brain’. These friendly soil born organisms were a gift from nature which acted as a natural buffer to safeguard and maintain a healthy intestinal microbiome balance. Around the end of the 19th century the introduction of pesticides, herbicides, and other chemicals into food processing quickly diminished the “farm to table” ingestion of raw fruits and vegetables which contained these life-sustaining organisms. The trade-off of killing unwanted pests was that we also killed off the friendly soil born bacteria that benefited our digestive tract and our immune system, paving the way for today’s auto-immune diseases and extensive gut related health issues. Today, 99% of the foods we buy at the grocery store simply DO NOT contain these friendly organisms. What are SBOs (Soil Born Organisms)? SBOs (Soil Born Organisms) are microorganisms that originate in the soil, where they prevent bacterial and fungal overgrowth, provide nutrient uptake and help produce mineral rich soils which are critically important to growing healthy organic foods. SBOs also crowd out unfriendly organisms that lead to plant disease. An important biological advantage of SBOs is their ability to survive cold, heat and drought. In nature, SBOs can lay dormant for long periods of time regardless of how harsh the environmental conditions. And, when the miracle of nature once again produces the right conditions; they spring to life, reconstitute, multiply, and thrive. Think of a dried up pond after an extended drought. It appears the algae has all died and disappeared, but in truth, it is simply dormant awaiting the rains to return when once more the pond will be teaming with living algae and other vegetation. This biological miracle which allows Body Biotics™ to be so uniquely different and effective, has also made it difficult over these years to explain to our consumers why we do not list the number of Colony Forming Units (CFU) on our product. These next few paragraphs should help to clarify this. What are Colony Forming Units (CFU)? This last statement is critical to understanding the dynamic nature of Body Biotics™. If we were to enumerate the CFU numbers on our label, you would be more than impressed. However, since we know that the term CFU has “little to nothing” to do with the actual efficacy of a Probiotic, we chose not to use this term. Instead, we hope to offer our consumers a broader, deeper understanding of the biological nature and wide range of health benefits available to them from a “natural” SBO Probiotics Consortia™. The same kind of SBOs which originated in the soil and once protected us through our daily consumption of organic “farm to table” foods. 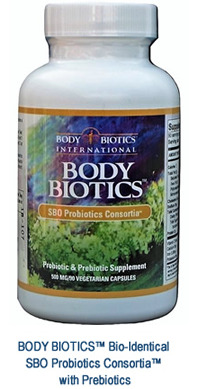 SBOs were intended to be ingested every day of our lives from our organic food source. If you are not eating a diet that is predominantly organic, you are missing a vital link necessary for you to maintain a strong immune system and keep your “friendly versus unfriendly” gut bacteria in check, as well as, a vast range of many other critical health benefits. 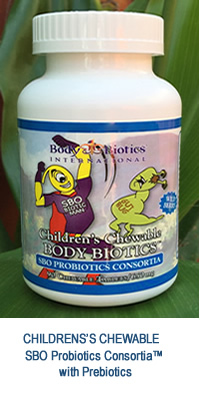 BODY BIOTICS™ Bio-Identical SBO Probiotics Consortia™ is one of the few known Probiotics that mimic nature so closely as to provide the full benefits of a true Probiotic. Cultured and encapsulated in its own ancestral Prebiotics food source of humic and fulvic acids, which are billions of years old, extracted from deep within the earth to provide a pristine, GMO free, toxin free, chemical free, nutrient rich host medium. They are naturally dehydrated (not freeze-dried), rendered dormant as in nature, and waiting to be ingested with an aqueous solution so they can, once again, thrive. Once thriving, they provide the same bio-identical health benefits we used to enjoy before the introduction of harsh chemicals into our farming world in the mid-1950s. BODY BIOTICS™ has been marketed under several names during the past 37 years. You may have known us as: Earth Flora™, Natur Earth™, Natur Zyme, or Nature’s Biotics™. Heyman, et al., 2002 and Husebye et al., 2001 http://cdn.intechopen.com/pdfs-wm/35443.pdf ; [Rolfe, 2002], [Lin, et al., 1999], [Bravo, 1998, Tieking, et al., 2003, Zvauya, et al., 1997, Seppo,et al., 2003, Calderon, et al., 2003, Mensah, et al., 1995, and Olsen, et al., 1995]. Vol. 05 - Iron Supplements - Friend or Foe? Vol. 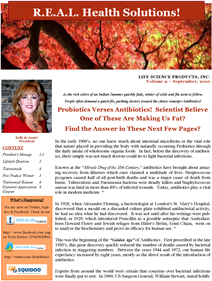 10 - Are Antibiotics Making You Fat? Your gut aka: "Second Brain"